In the early days of the pioneers, when bison roamed America, a single herd could stretch for over a hundred miles. 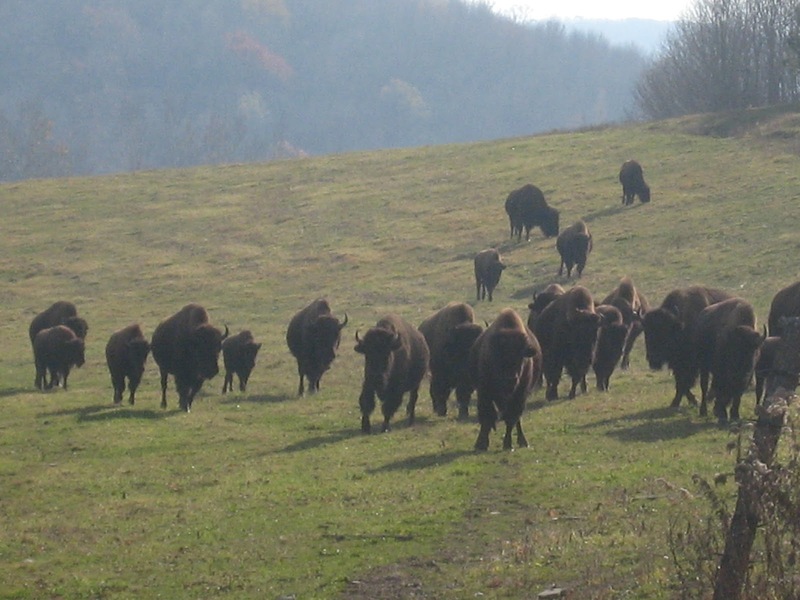 Here in Western New York, some of our old roads can be traced back to bison trails, where the huge, shaggy bovines migrated down from the Great Lakes. 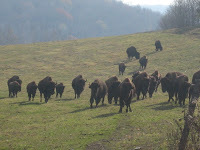 Hunters put paid to that and at one point there were only a few hundred bison left in America. Our main city of Buffalo – you’re not really supposed to call bison buffalo, although most people do – has some fibreglass ones strategically placed along the motorway intersection but it’s not quite the same. 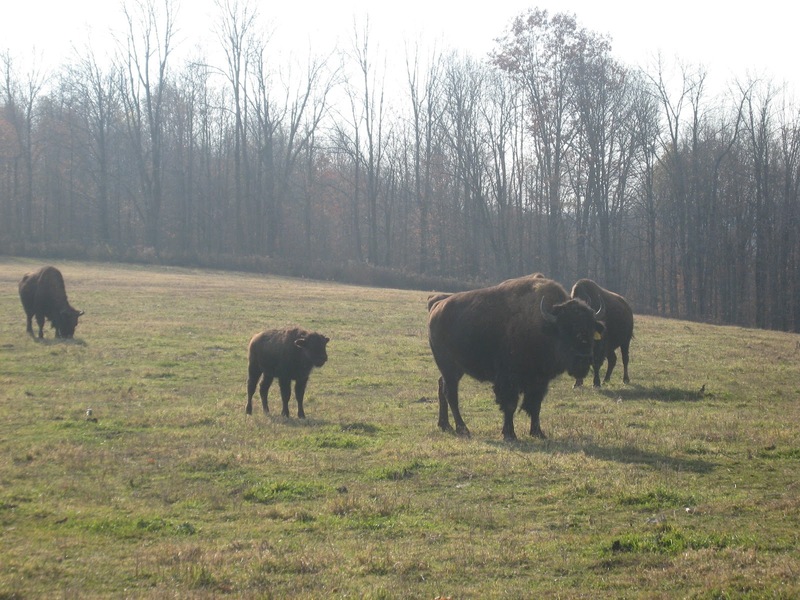 But bison numbers are growing again, thanks to conservation and commercial farming. Bison now compete in shows and get gold medals. Jeff, in the next village to us, has a bison ranch. He was in a high-powered job, taking some 150 flights a year and as he puts it, burning himself out. He went out West, studied bison, tasted the meat and was hooked. He came back to live in western New York, reclaimed the old family dairy farm, added some more land and set off to a South Dakota sale to buy his bison. He realised quickly that the ones that won the gold medals were going for 11,000 dollars each, a bit beyond his budget. So he waited for the also-rans, by which time everyone else had gone home. He brought back 56 calves. We were riding in his pickup truck in the late autumn sunshine, over a wide, grassy hill with some of the loveliest views in the county. 85 of the stately animals eyed us curiously, sniffing and grunting and blowing. “They’re very communicative,” said Jeff. 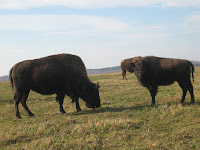 The curly long hair on their massive heads and shoulders is there for a reason, as they stand with their faces to the wind and dig deep in the snow for their food, something cows can’t do, which means the bison can survive in harsh conditions. In the spring the hair falls off – you can collect it and use it to make scarves. You can’t even try to keep bison in a barn. They’re highly intelligent, they can run at 35 miles an hour, turn 360 degrees on their fore or back feet and jump six feet. A male can grow to 3,000 pounds. Jeff’s fences are electrified to withstand 185,000 pounds. Still, if they really want to get out, they will, especially when two males are fighting for rank. They’re not naturally aggressive to humans, Jeff assured me, unless it’s a mother protecting her calf. 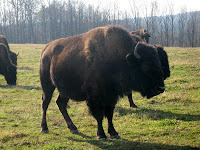 Though the ones he reared treat him like a brother bison, which means challenging him for a place in the pecking order. Sometimes it’s expedient to get out of there and quick. “If you see their tails go up and their heads go down, it means they’re getting stressed”. High on the ridge, we drove past the foundations of former farms, marked now just by rows of stones. Five generations of Jeff’s family farmed here and his great-great grandmother lies in an old cemetery on the hill opposite. 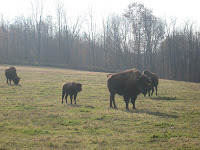 Ironic really – the houses had gone, the bison had returned. Just then, two deer raced across the field, one taking the fence in its stride. The bison herd had gone back to grazing, tails safely down, grouped on the brow of the hill, framed by the sun, just like one of those old Westerns. “People think I’m nuts,” Jeff laughed. “But this sure beats riding on a plane”.